A supply of emergency drinking water for at least two weeks or a means of purifying water plus a source of water if the water delivery infrastructure fails? Is at least some of yor water supply portable in case you must evacuate the area? An emergency supply of life-sustaining medications? A means of protecting yourself from the sun, wind, rain and cold if you must evacuate? An emergency toilet or other means of containing human waste? Comfortable closed toe shoes in case you must walk long distances and/or over debris and broken glass? Will these supplies be readily accessible and portable if you must evacuate and cannot re-enter your home? Do you have stashes of supplies where you spend your time – at home, work, school, and in your vehicle? Make a commitment to yourself to procure needed supplies ASAP. Identify the role(s) you want to be able to play in response to disasters. Do you have the training you need to play those roles without putting yourself or others at risk of injury or death? Is that training current? Do you have any physical, mental, or emotional challenges that might impair your ability to play those roles? Do you have any special needs that must be met in order for you to respond? (Like caring for loved ones or pets?) If yes, are you or someone else prepared to meet those needs? Make a commitment to yourself to get the training you need ASAP and to keep your skills current once trained. 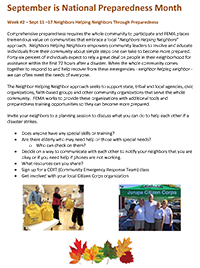 Do you have a plan as to what you will do if away from home or if your home is unsafe to occupy when disaster strikes? Have you communicated that plan to loved ones? 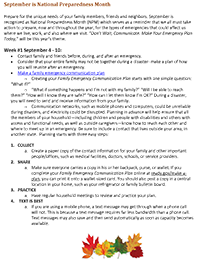 Do you have an out of state contact through whom you can communicate if you must change your plan after the disaster strikes? Is your out of state contact’s information programmed in your cell phone and/or do you have their phone number memorized? 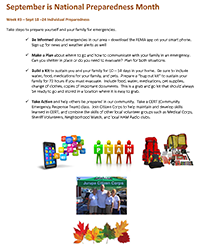 Take the time NOW to develop and communicate your emergency plan and to program emergency contacts under your phone “In Case of Emergency” setting and/or with the letters ICE for local emergency contacts and OOS for “Out Of State” contacts in front of the person’s name. Once you have prepared yourself, then move on to prepare your family and other loved ones and get involved in making sure your immediate neighbors and local community members are prepared to help one another in major disasters as well as every day emergencies.